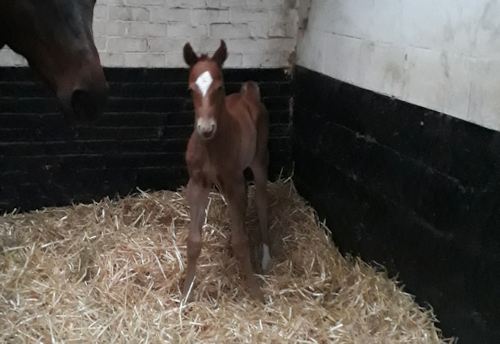 Chestnut colt by Oustrip out of winning mare Rhythmical. Dam Rhythmical won on her debut at Leicester in 2015 and was also placed at Goodwood, Newmarket and Musselburgh. She had an official rating of 85 at her peak. OUTSTRIP (GB), Grey or Roan horse, 2011, by Exceed And Excel (AUS), out of Asi Siempre (USA), by El Prado (IRE). Won 3 races, value £508,454, at 2, from 7 furlongs to 1 mile, Breeders' Cup Juvenile Turf (c&g), Santa Anita, Gr.1, At the Races Champagne Stakes, Doncaster, Gr.2, also placed second in Veuve Clicquot Vintage Stakes, Goodwood, Gr.2, and third in Dubai Dewhurst Stakes, Newmarket, Gr.1, St James's Palace Stakes, Ascot, Gr.1. Retired to Stud in 2016.